Hyspan Precision Products | Mason-Dallas Inc.
Mason-Dallas is proud to offer Hyspan Products. 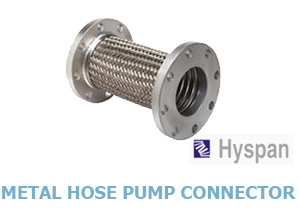 Hyspan leads the way in the design, development and testing of metal bellows expansion joints, packed slip expansion joint sand ball joints for industrial applications including the most severe operating and environmental conditions. 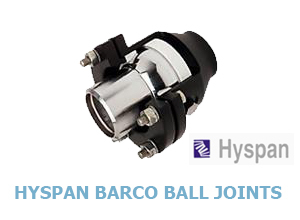 Hyspan Barco Ball Joints provide a method of absorbing pipe movement for applications ranging from steam and hot water pipe expansion, tank and building settlement, seismic isolation, wave motion compensation on oil platforms and drill ships, solar panel movement, oil well riser expansion and safety relief valve escape piping. 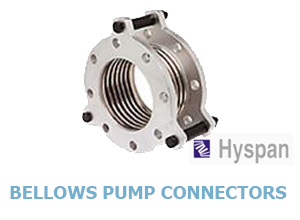 Series 4500 Metal Hose Pump Connectors are designed to be adjacent to mechanical equipment to isolate vibration, absorb small movements and to facilitate installation. The metal hose and braid are heavy duty industrial weight products. 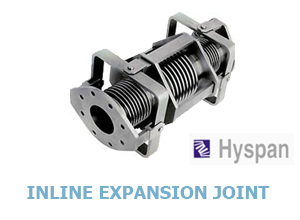 Hyspan has developed unique pressure balanced expansion joint designs that permit axial, lateral and angular movements without the necessity for main anchors to react the pressure thrust, or a change in direction of the piping. The Universal Hinge in-line pressure balance expansion joint permits axial travel, and lateral and angular motions in one plane. The Universal Gimbal permits axial travel, and lateral and angular motions in all planes. Series 4500 V-Flex Connectors are designed to absorb thermal expansion or contraction, or for seismic isolation of steel pipe or copper tube installations. 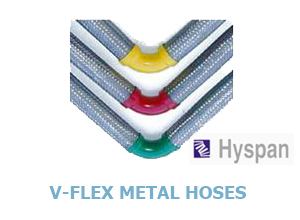 The braided metal hose elements that are incorporated into the design offer benefits that are not available in other products that are used for these applications, and the unique Hyspan “V” configuration provides advantages over other metal hose connectors. Series 5500 Bellows Pump Connectors are designed for installation adjacent to mechanical equipment to isolate vibration, absorb small pipe movements and to provide flexibility during installation. The bellows element is laminated (3 ply minimum) for maximum flexibility and fatigue resistance. Standard configurations include integral full thrust limit rods to react the full pressure thrust or compression for vacuum conditions..